When Tanja Malo started her little shop selling vintage linen threads, never did she envisage the journey it would take her on. 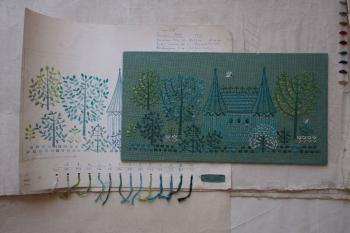 Through sheer dedication and determination she sought out the history of Swedish linen, and uncovered a lost embroidery archive, treasure trove of original drawings and embroidered samples. A part of this wonderful Scandinavian archive will be unveiled for the first time in the UK, at the Fashion & Embroidery show – Not to be missed! 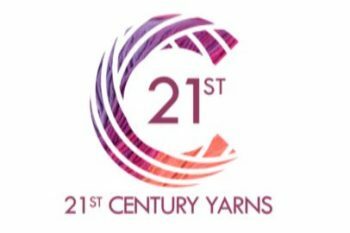 21st Century Yarns specialise in hand-dyed luxury natural fibres which they have been supplying around the world for over 30 years. Their Silks, Cottons & Wools are available in a stunning array of over 70 variegated colourways in different thicknesses and textures suitable for embroidery, quilting, felting, lace making, knitting, crochet, weaving, canvas work and other textile art. Find them on stand K17. This year we challenged you to create an embroidered piece of work inspired by Royalty. Whether inspired by a recent Royal occasion; hundreds of years of history; looking to foreign lands or delving much further back to ancient Egypt we asked you to create a rich tableaux in stitches. All entries were displayed and judged on the first day of the show, with the prize giving on Sunday afternoon. This beautiful exhibition seeks to keep memories alive from our wartime generation. Stories of comradeship, bravery, victories and setbacks were captured in letters received by relatives. 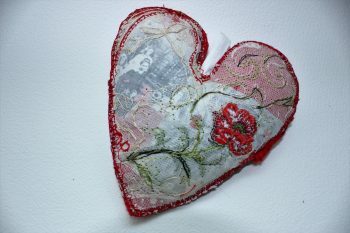 Using cloth and thread as both medium and metaphor, artists interpret these stories as sensitive images stitched onto hearts. In conjunction with the SSAFA this will be a unique and thoughtful exhibition to commemorate those that took part in WW1. Fast Track entry | Show Guide | Crafty Beggars mini Make & Takes | Exclusive use of the Shop & Drop area | Hot and cold drinks, pastries & cakes. 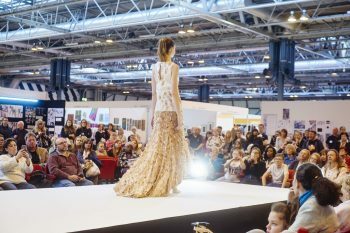 As with the very first Fashion & Embroidery show back in 1989, we are thrilled to still bring you the latest student’s creations in our daily catwalk shows, along with exciting collections from exhibitors. On Friday lunchtime our catwalk will host the final of this year’s Student’s Fashion Design Competition: Designing for the Metropolitan Ball! Come and meet our hand selected group of Search Press authors, watch them demonstrate their talents and have a go yourself. We will have: Lisa Marie Olson, Sue Stratford, Tilly Rose, Monica Russel and Mr X Stitch! Come along to pick up ideas and inspiration for your own crafts at home. Don’t miss their workshops either, choose from: crafts and stitching (scroll to the bottom). 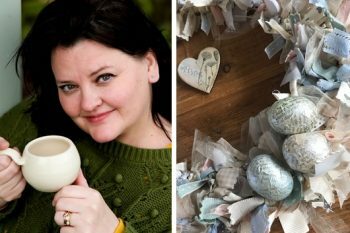 Wendy Turner Webster will be launching the brand new ‘Team Crafty Beggars’ at the NEC, providing four days of completely new seasonal workshops. Visitors can also take part in the Team Crafty Beggars free prize draw for the chance to win a spectacular range of crafting goodies! Use #teamcraftybeggars on social media to keep up with the latest news! Don’t miss their workshops either, choose from: crafts and stitching (scroll to the bottom). 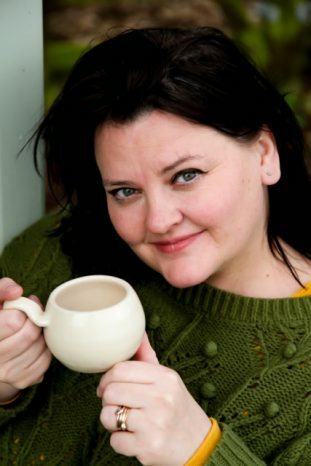 Wendy heads up the ‘Team’, having presented and co-produced the Crafty Beggars TV series for the past 5 years. 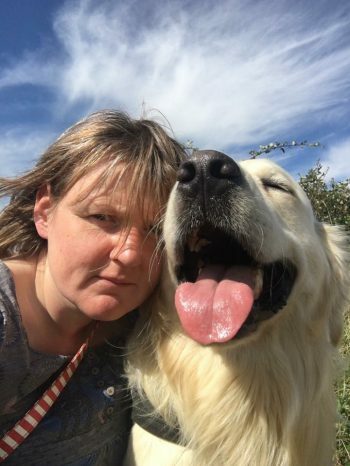 She specialises in mixed media projects and always maintains that she gets her creative abilities from being born and bred in The Potteries – home to the world’s most famous manufactures of ceramics. Wendy took Ceramics at A Level and loves the versatility that working with clay offers. 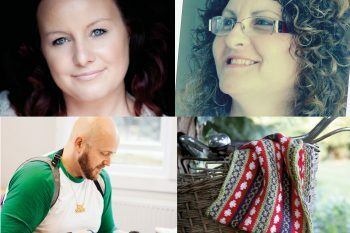 After working with so many talented crafters for the TV show Wendy came up with the concept of Team Crafty Beggars, and is delighted that this Creative Craft Show event sees the official launch of these remarkable artists. 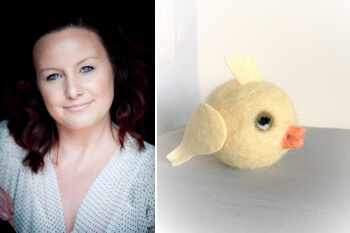 Lisa Marie Olson, author of Felt Wonderland is a creative entrepreneur who designs in all things’ wonderland, from the heart of her home studio in the Midlands! 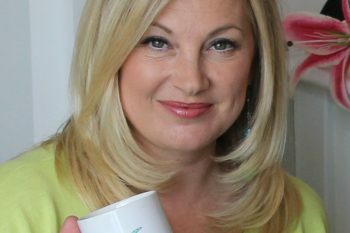 As Seen on TV, “Award Winning” and Voted Best of British are just a few of the highlights of Lisa’s creative life. Lisa Marie is incredibly proud to have been selected to represent the Crafty Beggars at the Creative Crafts Show in March 2019, as part of Team Crafty Beggars. So why not step into wonderland and be transported to another world of creativity with the fabulous workshops on offer at the show. 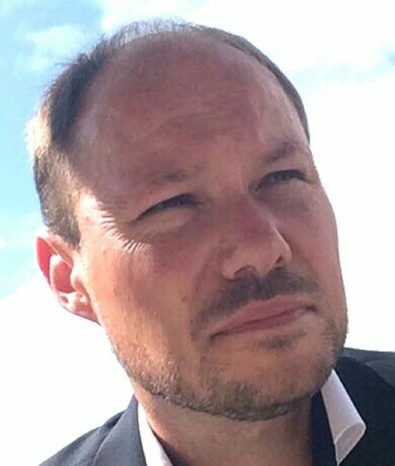 Mark Vardy founded Silvar Design in 2004. Originally an electronics engineer, Mark is now a silversmith, running workshops in silver jewellery-making and enamelling on copper from his studio in Staffordshire. 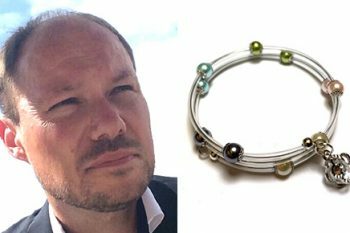 Mark also designs jewellery kits ranging from simple elasticated bracelets and earrings to macrame and kumihimo braiding. Mark has presented these for sale on a number of craft shopping channels since 2015. Mark is a qualified adult education teacher. 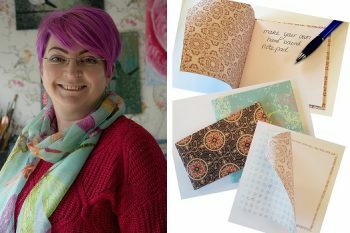 Ali is a mixed media crafter and one half of Stamps Away. She loves teaching and demonstrating all manner of crafting but with a particular reputation for using the everyday items, in a crafty way. 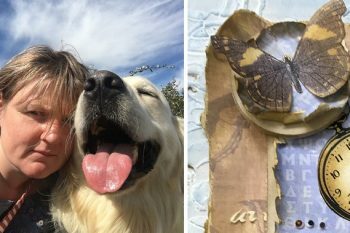 She has been demonstrating on the craft shopping channel now for 10 years and is known for her unusual techniques. And is looking forward to an exciting 2019 with Team Crafty Beggars. 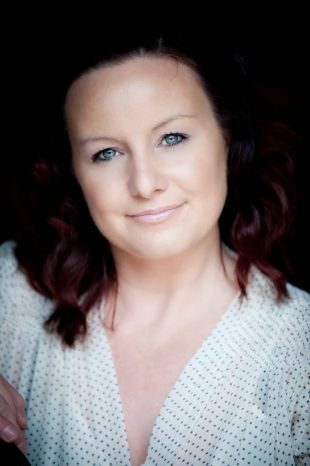 Melissa is founder of Simply Vintage Designs which was born from a love of all things vintage and handmade. She brings handpicked original vintage items, haberdashery and fabrics back to life using modern and traditional crafting techniques. Her workshops are a relaxed, creative environment where up-cycling meets creativity. 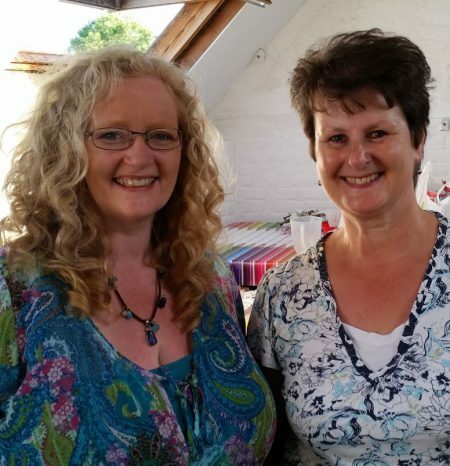 Melissa is a regular guest presenter on Hochanda TV and a proud member of Team Crafty Beggars. 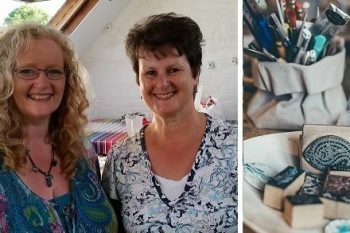 Janie is an established mixed media Artist and designer, she teaches many forms of arts and crafts and can be seen demonstrating on Hochanda TV with her Hobby Art stamp collections and Bizarre-ology MDF mixed media techniques. 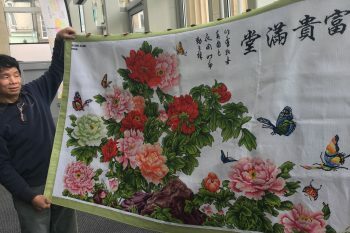 These larger than life tapestries created by embroiderer Yao Ming Chien have to be seen to be believed. They say a picture speaks a thousand words and these works of art really do speak from Yao’s soul. Born deaf, Yao was introduced to embroidery by friend and soon discovered his immense talent. These hand stitched pieces can take up to four months to complete and require a magnifying glass to achieve the level of intricacy desired! 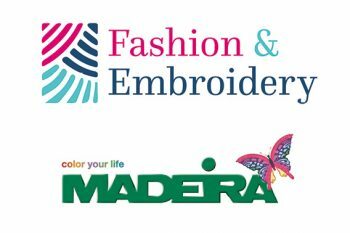 The theme for the Madeira embroidery competition 2019 is Glimpses of Royalty. We are challenging you to create a rich embroidered piece inspired by royals throughout history – choose to capture Harry and Meghan’s romance, the grandeur of Queen Elizabeth, or even a Pharaoh of Ancient Egypt! With thousands of years of history to explore, there’s no end to what you can create – show us your rich tableaux in stitches and you could win one of our amazing prizes! Supported by Stitch magazine with the Embroiderers’ Guild. Enter here and find out more! 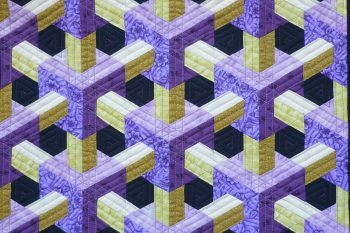 Come and see this huge, colourful explosion of over 40 quilts all designed with illusion in mind. There’s everything from 3D effects, transparency, impossible triangles and more! All pieces were created by The Modern Quilt Group of the Quilters’ Guild of the British Isles. Get hands-on at a Make & Take or workshop and create your own crafty masterpiece! There’s a wide range of creative crafts to try. Book at the show – visit the stand number of the workshop you wish to book. 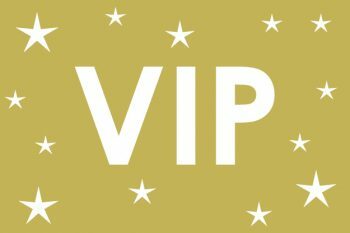 Our VIP passes are just £35, you will be prompted to upgrade when you buy a normal ticket. We can’t wait to see you there! 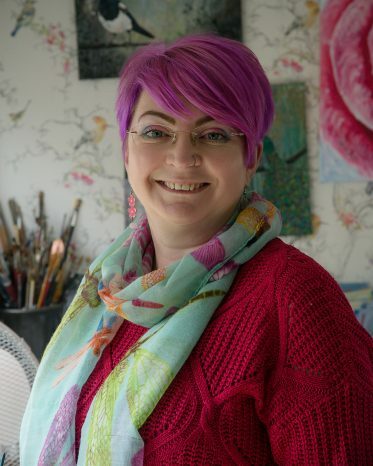 Lisa Marie Olson, author of Felt Wonderland is a creative entrepreneur who designs in all things wonderland, from the heart of her home studio in the Midlands! 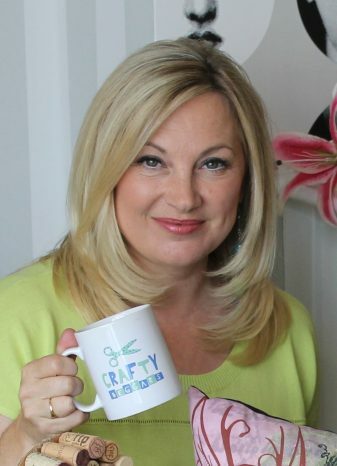 As Seen on TV, “Award Winning” and Voted Best of British are just a few of the highlights of Lisa’s creative life. Lisa Marie is incredibly proud to have been selected to represent the Crafty Beggars at the Creative Crafts Show in March 2019, as part of Team Crafty Beggars. So why not step into wonderland and be transported to another world of creativity with the fabulous workshops on offer at the show. Make and Takes: Come and learn how to needle felt a cute chick or bunny head in the Crafty Beggars VIP area. Make and takes: Use a variety of beads, tubing and charms to make a delightful spring memory wire bracelet in the Crafty Beggars VIP area. Make and takes: In these sessions you will learn how to bind a paper covered notepad with a selection of lovely decorative papers. This simple technique can then be used, by you at home, to create various sizes of notebooks and journals. Make and Takes: Learn the ancient art of block printing using beautiful Indian wooden blocks and fabric paints in gorgeous colours.